A historic town of beauty set between the mountains and the sea. Soller is a beautiful city that is set between the mountains and sea and has a long history because it has had human occupation since 5200 BC. 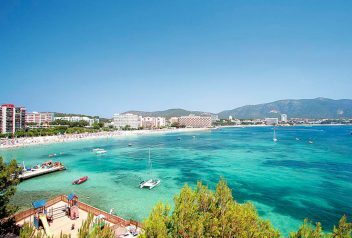 Because it was set in the Tramuntana mountains it was pretty much isolated from the rest of the island and this did have its advantage as it was excluded from the occupation of the Romans. Soller did however come under attack from pirates and sailors. That is the reason the town is actually built inland but it did not help much as they often had to fend off Pirates from Algeria who were after the treasures that Soller had. There was the famous battle in 1561 when the Sollerics fought off the Moorish Algerian Pirates and the day is still celebrated today in May. The town is very rich in citrus fruits and olives. In the early days, there were no roads to the rest of the Island so the fruit was exported to France and that is where a lot of the Sollerics made their fortune and is evident with some of the homes that are in Soller still today. 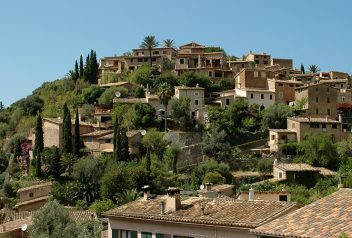 Soller is in a beautiful setting and the surrounding countryside has some lovely panoramic scenes. Most people that come to Soller come to enjoy the sunshine and exploring the countryside. 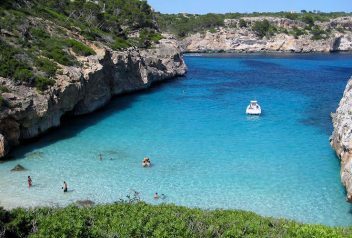 There are numerous hiking trails of which some are along the coastline and ones that go deep into the Tramuntana Mountains. There are bicycle tours that holidaymakers can enjoy to explore all the scenic mountain areas and along the coast. 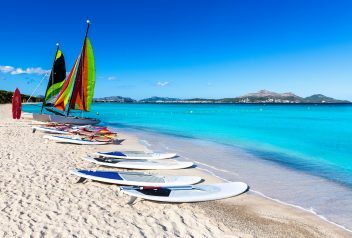 Being close to the coast there are numerous boating activities that one can do. 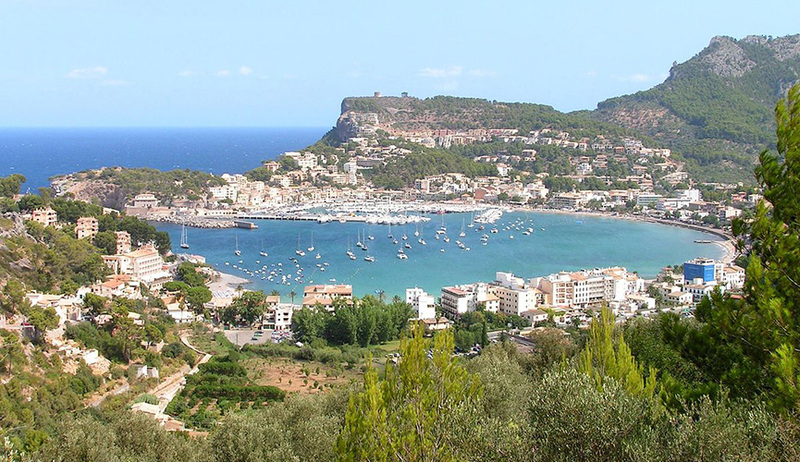 The beaches in Soller are not big and get very busy during the summer months. The Sollerics like playing tennis so if you are after some exercise there are numerous public tennis courts available. The promenade hosts numerous cafes along the beach and offers refreshments for the tourists that have decided to have a relaxing day on the beach. Soller is filled with some great modernist architecture and because it was such a rich little town from the Orange industry some of the buildings are impressive and the Church of Sant Martemou in the town square is a good example of this. Soller is a typical Mediterranean town with narrow streets which are mostly residential but the main square has plenty of cafes to visit and hosts a market every Saturday. If you would like to see some of the histories of the town then a leisurely walk up to the cemetery which is filled with lovely pot plants will give a good idea of the town’s history. Because the French had such an influence in the town there are quite a few graves that are inscribed in French. There are some museums and the botanical gardens that one can visit and a very interesting art gallery. Soller hosts a large range of hotels that will suit most budgets. Some of the better-known Hotels are the Ca’s Curial which is a five-minute walk out of town but it is an old farmhouse that has been converted to a hotel and Hotel l’Avenida is probably the best boutique hotel in Soller. Soller does not host a lot of top restaurants but there are plenty of cafes where you can get a light meal but if you want a fancy meal then the hotel restaurants will be your best choice. The nightlife is mainly having a few drinks at the numerous bars that are available and some of them do have music that you can dance to. The Hotels like Aimia Hotel have lovely terraces where on can enjoy an evening drink. Soller is one the most sought after place to live in Mallorca and it is because of the beautiful mountains, the coastline and fertile fruit filled valleys. 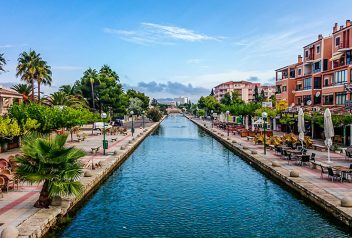 For the tourist, it offers great Nordic walks and some delightful architecture and some bars to have a relaxing evening after a day in the sun.